Luxury hotels, department stores, and restaurants are always pushing the limits of grandeur to impress their customers. And what could make a hotel or restaurant look more lavish than a drink or suite package that comes with a real diamond? Even if the $10,000 martini with bling at the bottom doesn’t sell very well, it certainly generates press and adds splendor to a cocktail menu. What is the marketing advantage of these extravagant package deals? “People of extraordinary wealth want a story you can tell, or an experience you can share on social media,” says Allen Adamson, branding expert and chairman of Landor Associates. “The world of luxury branding is quickly becoming a world of ‘can you top this?’” While a business traveler at a hotel or restaurant may feel comfortable just having a nice meal or night’s sleep, those traveling and dining for leisure often feel a desire to extend the moment through Facebook, Instagram, or Snapchat. Storytelling about experiences, for the past decade or so, has become as important as the experience itself. In a way, every time a customer buys a diamond-augmented experience, it’s almost like they’re buying a free ad for the hotel. 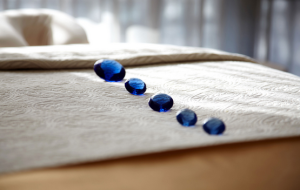 So what kind of diamond amenities or experiences are on offer around the globe right now? The New York Palace Hotel has teamed with jewelry designer Martin Katz to create the Jewel Suite, a two-story, 5000 square-foot penthouse that costs $25,000 a night and houses up to six guests. 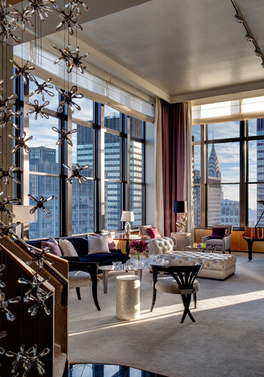 Along with more standard luxury amenities (a private rooftop terrace, complimentary champagne, sweeping views of the Manhattan skyline), the Jewel Suite comes with a complimentary Diamond Microband Ring, valued at $2,500, that the guest can customize in a private meeting with Katz himself. What sorts of customers does this jewel-studded hotel room attract? “The Jewel Suite by Martin Katz has played host to celebrity clientele, both for personal stays and when in New York City to promote professional projects,” said hotel managing director John Tolbert in an e-mail. “Both The New York Palace and Martin Katz cater to the same caliber of clientele.” Tolbert says the hotel also rents out the Jewel Suite to such publications as Vogue and celebrities like Oprah Winfrey for photo shoots and interviews. The Ritz Carlton Tokyo is the tallest building in Japan’s capital city, so it only makes sense that the hotel’s Lobby Lounge and Bar serves Japan’s most expensive martini. The “Diamond is Forever Martini” sells for ¥1.8 million (over $14,000) and includes a one-carat diamond valued at around $8,000. The additional $6,000 is the cost of having the diamond presented by a cocktail waiter in front of the spectacular view. The hotel has sold only two of these martinis so far—one for a proposal and one for an anniversary gift. But the bartenders keep a diamond on hand in preparation for a third buyer. Trump SoHo hotel-condominium may seem like just another $450 million dollar installment in the Trump real-estate empire, but it offers some amenities you just can’t get anywhere else. One of the hotel’s spa features is the “Diamond Dust Body Treatment” treatment, which features a rubdown with rare diamond-dust infused beauty oils. Even though the cosmetic value of diamond dust is disputed, spa Director Rachel Knapp claims that this lavish treatment attracts many of Trump Soho’s moneyed customers. The Spa’s Menu says the treatment offers a “balancing of the chakras by applying luminous mud combined with Diamond dust using magnetic tools to remove toxins in your body.” With rooms ranging from $375 to $2,070 per night, it may be no surprise that guests are willing to spend $295 on a treatment that leaves their skin (temporarily) glistening. Once the favorite drinking spot of New York’s sharpest literary types, the bar at the historic Algonquin Hotel still serves upper-class nostalgia to locals and tourists alike. For those looking to pimp-out their nightcap, the hotel’s Blue Bar serves a diamond and drink package called “Martini on the Rock,” and the price can run anywhere from $10,000 to $15,000, depending on the size and cut of the diamond a customer requests. 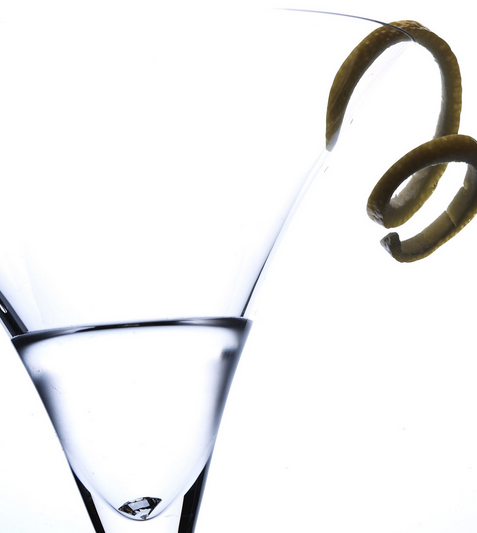 The Martini on the Rock is the worst-selling drink on the menu. 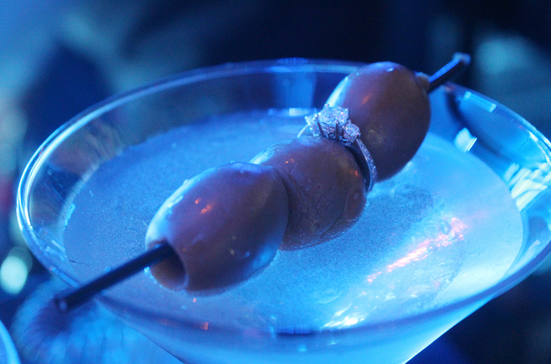 In keeping with the martini theme, the Vaucluse Lounge in West Hollywood serves a shaken-or-stirred vodka cocktail with a one-carat diamond from Hollywood-based Raffi Jewelers resting at the bottom. Brad and Claire Cox, the Australian couple that owns the restaurant, claim to have sold just 12. But the diamond martini has generated a lot of buzz around Vaucluse Lounge, which was probably its main purpose as a menu item. Even 2Chainz has tried it. This article appeared in yesterday’s online edition of Bloomberg, written by Jack Ellis.